Newborn jaundice, also commonly known as infant jaundice, is a condition characterised by the yellowing of the eyes and skin of a newborn baby. It happens because the baby’s blood contains a high level of a yellow coloured pigment called bilirubin. This phenomenon is common in the case of preterm birth and also among breastfed babies as their liver is not fully developed to get rid of the excess bilirubin. However, in most cases, the condition passes on its own as the baby gradually starts to feed. An excess of bilirubin or hyperbilirubinemia: Excess of the yellow pigment called bilirubin is the primary cause of jaundice in your newborn baby. Bilirubin is responsible for the yellowish tinge typical of the condition. Normally, the liver of your baby eliminates bilirubin from the bloodstream and passes it on to the intestinal But due to the immaturity of his/her liver, your newborn can develop this condition. Premature birth and deficiency of breast milk: This condition is also common for premature babies and babies born before a gestation period of 37 weeks. It is also observed that newborn babies who do not get sufficient breast milk or are finding it difficult to feed are prone to newborn jaundice. Incompatible blood types of mother and baby: If the blood type of your newborn baby is not compatible with yours, it can increase the chance of newborn jaundice. Due to this incompatibility of blood types, your baby might develop a growth of antibodies that terminate red blood cells, thereby increasing the level of bilirubin. Exchange blood transfusion: This should be only considered if phototherapy fails to work. In this procedure, blood is withdrawn from your baby to get rid of the bilirubin and then again injected back into the bloodstream. Your newborn baby is kept in intensive care during the process. Intravenous immunoglobulin (IVIg): This procedure is employed in case yours and your newborn baby’s blood types are incompatible. Your infant is supplied with a transfusion of immunoglobulin, which helps combat antibodies transferred from you, i.e., the mother. Immunoglobulin is a protein that aids in reducing these antibodies, which attack the red blood cells of the newborn. 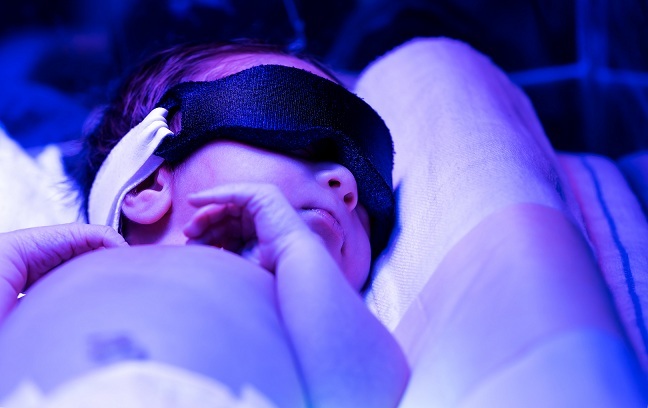 In case you notice any symptoms of newborn jaundice in your infant, seek professional help immediately as not doing so can often put your baby’s life at risk. Besides with timely and proper treatment, your baby will be able to recover in no time.